Marinate the Hiramasa in the 1 Cup of Ponzu Sauce for 1 Hour. Turn frequently to insure the entire filet has been submerged in the Ponzu. Drizzle the Sesame Oil into the hot pan. Insure the Hiramasa has been thoroughly coated in the marinating liquid and place the Filet into the hot pan. Allow to sear quickly on all sides. (Approximately 15-20 Seconds per side). Gently turn the Hiramasa Filet until all sides have been seared. Remove from the pan and immediately place in the bowl of Ice Water. Allow to remain in the water for 1-2 minutes to completely stop the cooking. Remove from the water and place on a towel to dry while preparing the remaining ingredients. One of the finest fish used in sashimi dishes is the Yellowtail Kingfish. A natural inhabitant of the South Pacific Ocean, specifically the waters off Southern Australia, the Yellowtail Kingfish has many names. Amber jack, Gelbschwarz, Magiotiko, Che ruteiro and Lechas just to name a few. It is in Japan where the finest rich flavored fish is used to make sashimi is where the name Hiramasa was popularized. The distinguishable pale pink flesh is complemented by a sweet rich flavor. This is what makes the Yellowtail Kingfish or amerber jack popular both with Japanese and Western gourmets. At Anderson Seafoods, we describe only our farmed Yellowtail Kingfish by the Japanese term Hiramasa, differentiating it from those caught wild. Farmed Kingfish is the preferred choice of any experienced gourmet who knows only the finest will do. Hiramasa kingfish have a higher fat content, cleaner flavor, a texture that is firmer thus allowing for dish versatility but consistently delicious. 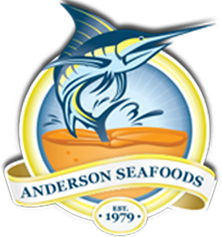 At Anderson Seafoods, we bring to your door Hiramasa farmed to the highest environmental standards, straight to your kitchen through our online store. Yellowtail Kingfish have elongated and moderately compressed bodies. They have a slender head that is proportionally longer than the depth of their bodies. They have between thirty to thirty five dorsal fin rays. They are often blue to bluish green or purplish green and silver white below. As the name suggests Yellowtail Kingfish can be distinguished by their yellow caudal fins. Adults live around rocky reefs, rocky outcrops and drop-offs in coastal waters, and around pinnacles and offshore islands. The maximum length has been known to reach up to 180 cm. They can be cooked a variety of ways like broiling, grilling, saut? and sushi. Farmed Yellowtail Kingfish are produced from wild brood stock, hatchery raised fingerlings are grown in an open water culture environment. Hiramasa is grown under compliance with ISO 14001 and ISO 9001 requirements. They are fed from only natural and sustainable sources. Unlike other farmed species of kingfish, Hiramasa differ in the type of feed used, no wild fish or land animal products are used. We at Anderson Seafoods strive to bring you only the best sashimi grade Hiramasa to you. Buying fresh seafood is as easy as a click away via our easy to use and informative website.